Conveniently near major road and rail connections in southwest England and South Wales, Bristol Airport is one of the main air transport hubs for the region. Our Bristol Airport guide features information on airport facilities, transfer options and contact details. A second airport extension project - following completion of the eastward extension in 2015 - is due for completion by the end of 2016, as is the construction of a 200-room on-site hotel which will operate as a 'Hampton by Hilton'. The information desk is situated in the public area of the terminal, before the security screening area. Bristol Airport is located just off the A38, which connects to the centre of Bristol (to the northeast). From the city-centre, follow the A38 southeast towards North Somerset. The journey time from central Bristol is approximately 25 minutes. From the north (Birmingham), turn off the southbound M5 at junction 18 and take the eastbound A4 towards Bristol, before connecting with the A404 and A38 towards Taunton. From the south (Exeter), leave the M5 at junction 22 and take the A38 towards Bristol. From the east (Reading and Swindon), join the M5 southbound, exit at junction 18, and take the A4 towards Bristol. From here, take the A404, which connects to the A38. From South Wales, follow the eastbound M4 over the Severn Crossing; at junction 22 branch left to join the M49 and then take the A4 at junction 18. Continue on the A4/A3029 and turn off onto the A38. Bristol Airport is located 13km (8 miles) southwest of Bristol city centre. Bus:Flyer Airport Express Link (flyer.bristolairport.co.uk) runs buses A1 and A2 between Bristol Temple Meads Railway Station, Bristol Bus Station, major city hotels, Clifton and Bristol Airport (journey time: 30 minutes; fare: £7). Tickets are available online. Local bus services also run to and from the airport and connect to Bath and Weston-super-Mare. Coach:National Express (tel: +44 871 781 8178; www.nationalexpress.com) coaches operate throughout southwest England and south Wales to Bristol Bus Station, where passengers can connect to the Flyer Airport Express Link, which runs to Bristol Airport. The 404 overnight National Express route between Penzance and London operates via Bristol Airport. The company also operates regular services to Cardiff. Fares start at £10. Taxi:The official airport taxi service is provided by Arrow Cars (tel: +44 1275 475 000; www.arrowprivatehire.co.uk). A 24-hour booking desk is located within the covered walkway that links the terminal to the adjacent car park. The journey time into central Bristol is 20 to 30 minutes; online pre-booking is available. Rail:The nearest mainline train station to Bristol Airport is Bristol Temple Meads, which is approximately eight miles away, near the city centre. The Airport Flyer Express Link (flyer.bristolairport.co.uk) coach service connects from Bristol Temple Meads to Bristol Airport every 10 minutes at peak times (journey time: 25 minutes; fare: £7 single, £11 return). Information on all national rail travel is available through the 24-hour National Rail Enquiries line (tel: +44 845 748 4950; www.nationalrail.co.uk). Bureau de change desks and ATMs can be found at Bristol Airport both before and after the security checkpoint. There is a choice of snack bars and cafés before security. A café, bar and a selection of places to eat – including a family-friendly restaurant and fast-food outlets – can be found airside. A good range of shops are located in the departures area, including a newsagent and a bookshop. The duty-free outlet in Departures offers a free collection service for passengers wishing to pick-up purchases on their return. A convenience shop is located in the check-in area and a newsagent can be found in the arrivals hall. Baggage trolleys are available at a cost of £2 (or €2) from various locations around the terminal. A porter service is available from Bagport UK (www.bagport.co.uk). Left luggage facilities are available via the main information desk in the check-in area. Mother and baby facilities are provided at suitable points of the terminal. A pharmacy is situated in the departures area. A number of meeting and conference rooms (tel: +44 871 334 4444), offering capacity for up to 100 delegates, are available within the administration building, which is close to the main terminal – other facilities here include basic office services such as fax and photocopying. The Aspire and AspirePlus Lounges are situated in the departures area and includes complimentary drinks and snacks, fax and telephone facilities, TVs and Wi-Fi internet access. Meeting facilities are also offered by some nearby hotels, including the Holiday Inn Bristol Airport (tel: +44 1934 861 123;www.ihg.com). Wi-Fi internet connection access is available throughout Bristol Airport (free of charge for up to 60 minutes – charges apply thereafter). Computer kiosks with internet access and printing services are also available pre- and post-security. Payphones are located at various points within the terminal. Bristol Airport features lifts to all floors, disabled toilets with help buttons and Braille signage. Wheelchairs are available on request. Disabled parking spaces are conveniently positioned in all airport car parks, with 30 minutes of free parking offered in the Express car park for blue badge holders. For general inquiries regarding passengers with reduced mobility, contact OCS (tel: +44 1275 473 403; www.ocs.co.uk). Passengers requiring special assistance should contact their airline before travelling. 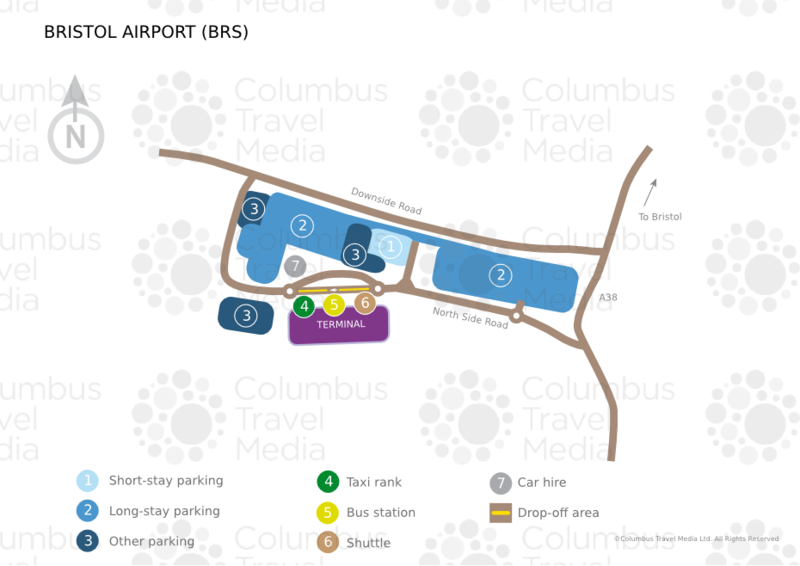 The short-stay car park is close to the terminal and is available for periods of up to three days. Secure Premier parking and valet parking are also offered near the terminal. Away from the terminal, the long-stay car park is a three- to four-minute courtesy bus ride away; while the economy Silver Zone car park (for stays of more than four days) is a six-minute courtesy bus ride from the terminal. All parking (tel: +44 871 334 4450) is bookable via the airport's website. Avis, Budget, Enterprise, Europcar, Hertz and National are represented at Bristol Airport. Each of these hire-car providers has an office located opposite the terminal building, next to the Premier parking and long-stay car parks.